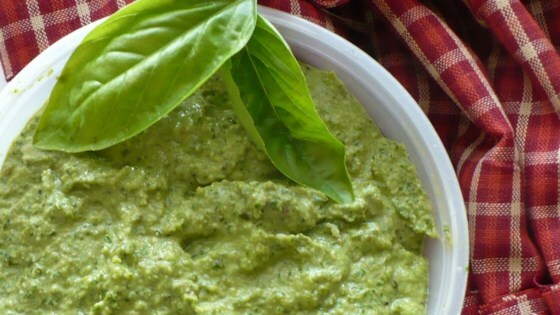 Place the arugula, basil, pine nuts, garlic, and olives in a food processor, and chop to a coarse paste. Mix in olive oil, lime juice, vinegar, cumin, cayenne pepper, salt, and pepper. Process until well blended and smooth. I didn't like this very much, I think regular pesto is better. First experience with pesto and it was really good. A great way to use up the arugula in my herb garden. This is great, especially with more freshly grated parmesan on top. I made a big batch and froze what I didn't use and it tastes just as good after it's thawed. Really good Mark, but I do like to add cheese to my pestos. Due to allergies, I subbed with walnuts. Love the spice of arugula, so if you're a fan, you'll like this. Thanks! Here's an idea for this recipe- try it as a dressing on spaghetti squash- it's really good! I put in a little less than 1/2 a cup of olive oil instead of 3/4. tasty!